Using a spoon, spread white chocolate over one side of a heart. Smooth with the back of the spoon. 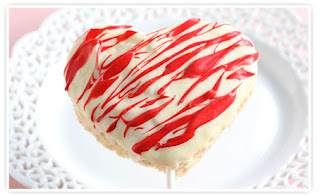 Using a small spoon, drizzle red chocolate back and forth over the white chocolate heart. Set on wax paper and let chocolate set up for 15 minutes. 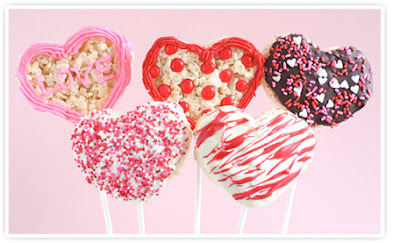 For more on this article, visit snackpicks.com/valentines day. Sometimes I like to "spice up" my Rice Krispie treats and use a different cereal like Special K. For some high value kelloggs cereal coupons, visit hip2save.com. Be sure to also enter my Progresso soup review giveaway and Orient Watch giveaway!! Mmmmmm...I love the white chocolate one! What great ideas!!! I'm going to make some serious red and pink treats this weekend. I hope I have time..